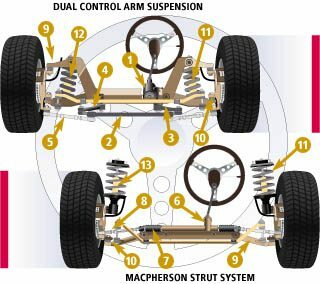 Today's Papillion car care article focuses on your suspension system. After many years and tens of thousands of miles, your car suspension system components do wear out, but how long that takes depends a lot on how you drive. As you can imagine, if most of your driving is on smooth Papillion highways, your shock absorbers will last a lot longer than if you do most of your driving on bumpy roads or hauling heavy loads. In addition to just wearing out, Yeck's Tire & Auto Repair customers need to know that suspension components can be damaged in an accident or by a hard impact - like a pothole, hitting a curb or a rock in the road. Because the life span of shocks can vary so widely, your car manufacturer and Yeck's Tire & Auto Repair recommend periodic inspections. During an inspection, your Papillion service technician will check for worn, broken or missing parts. Signs that shocks or struts are wearing out: The tires may have a cupped wear pattern. This is from the shocks bouncing unevenly as you drive around Papillion. You may notice a floaty or drifting sensation when cornering. If the front of your car dives excessively when stopping, or rocks back and forth after you stopped, your shocks may be worn out. And if they are leaking fluid, it's definitely time to replace them. If you are experiencing any of these symptoms, come into Yeck's Tire & Auto Repair for a suspension inspection. Same if you've been in an accident that involved one of your wheels. Worn or broken shocks can cause premature wear or failure on other car suspension parts such as ball joints and other steering components as well. If your suspension actually fails, it could lead to a serious accident, so let us take care of your suspension components at Yeck's Tire & Auto Repair. When you replace your shocks, it's usually a good idea to replace all four at the same time. That'll give you more even handling. Talk with your service advisor at Yeck's Tire & Auto Repair because you don't want a big difference between the performance of your shocks from wheel to wheel, and replacing all may be the safest bet. 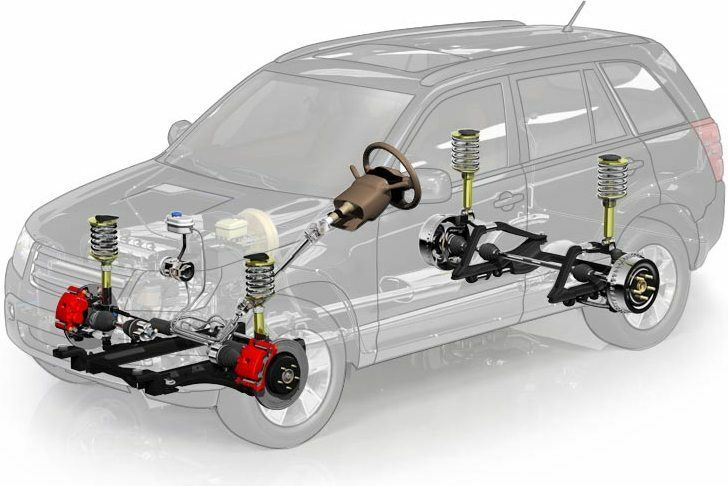 Let's talk about your suspension - you know, the system that connects your wheels to your vehicle, controls your handling and delivers a good ride as you cruise around Bellevue NE. Your suspension is critical for proper steering, stopping and stability. Hey, it's a rough world out there in NE - every time you hit a pothole, a bump or an object in the road, your suspension system has to absorb the impact and maintain control. When a joint or other part is worn the suspension parts don't fit together as tightly as they should. Handling and steering has a loose feel and you may hear strange noises. Your tires will wear unevenly because they're bouncing down the Bellevue NE road a little off kilter. When your Bellevue NE service advisor at Yeck's Tire & Auto Repair inspects your vehicle, he'll look for signs of suspension problems: things like uneven tire wear, excessive play in suspension components and other visible damage. He can replace the worn or damaged parts and restore safe handling. It's a great idea to take care of these problems right away before they become more expensive to repair. And nobody in Bellevue likes to see a tire that should last for several years get worn out in a matter of months because of a bad suspension part. Shock absorbers and struts last a long time and wear out pretty slowly for most trucks and other autos in the Council Bluffs area. They're easy to take for granted, but your shocks and struts do a very important job so you need to pay attention to them. They keep your tires on the road; and your tires are what connect your vehicle to the road and allow you to safely handle your car through turns, over bumps and even stop in time. When your shocks and struts are worn, your tires bounce excessively over bumps in our Council Bluffs roads. Your vehicle will wallow through corners; your front-end will dive when you stop; and your rear-end will squat when you accelerate. All this hurts your ability to control your vehicle. And your ride just isn't as comfortable. Replacing worn shocks and struts saves money in the long run for our local Council Bluffs drivers p;ndash; and of course you can't really put a price on your safety and that of your passengers. We generally recommend replacing shocks and struts at 50,000 miles. When it's time for new shocks or struts, we've got you covered in Council Bluffs. We can give you back the ride and handling of a new vehicle. And if you have special needs we can help you there too. We have premium shocks and struts that'll improve your performance. We can even help you with upgraded, heavy-duty shocks that'll give you the confidence you need to handle those big towing or hauling jobs.